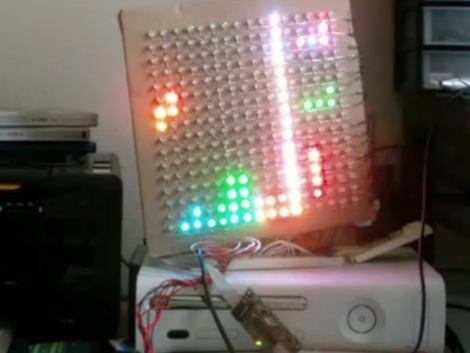 [Stan] built this LED matrix using a 16×16 grid of RGB LEDs. He built the hardware and wrote some subroutines to randomize the colors. He’s not using PWM because frame buffering is not feasible for the 1k SRAM limit of the ATmega168 he used. Instead, shift registers drive the lights which can be mixed to achieve eight different colors (including off for black) reducing the framebuffer size to just 96 bytes. After he got done with the build he realized this is sized well for a game of Tetris. We’ve seen AVR tetris, PIC Tetris, and Tetris using composite video but it’s always a pleasure to see a new display build. After the break we’ve embedded [Stan’s] demo video, several pictures, and a schematic. 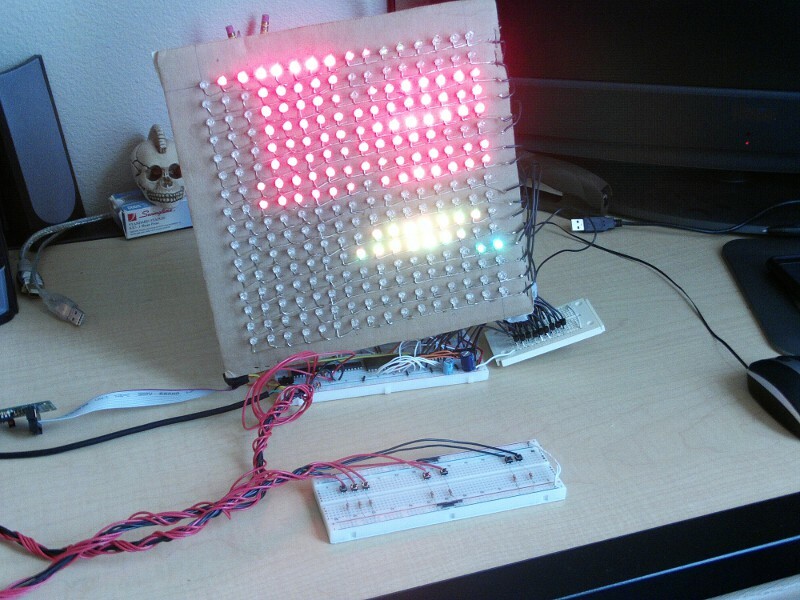 He’s using many of the same principles outlined in our How to Design an LED matrix tutorial. Why would PWM not be feasible? I understand you don’t want to do 24bit color with it, but surely 8bit (3r 3g 2b) should be doable? 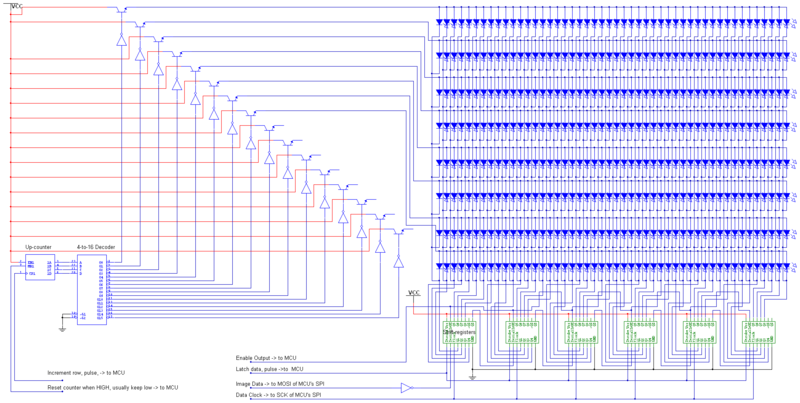 It’d take 3/4 of the sram, but in the worst case you could put the game logic in a 2nd AVR. 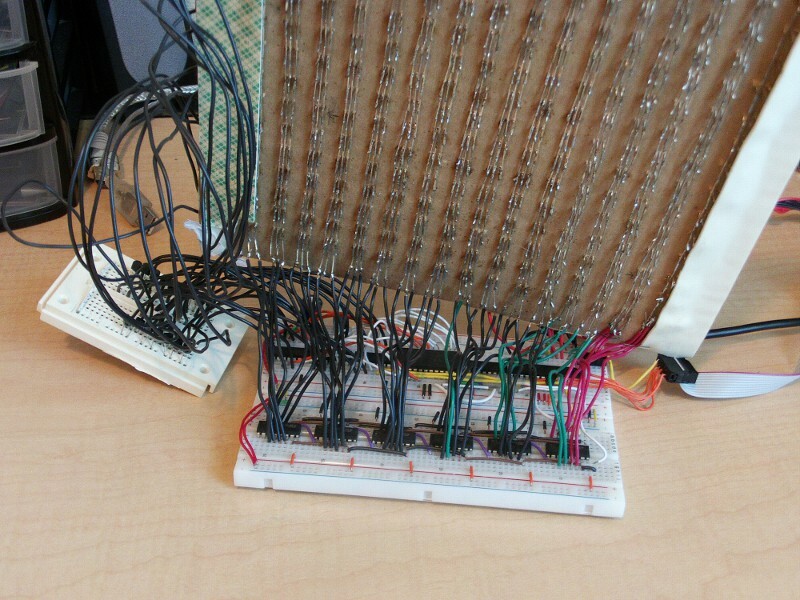 I imagine if he’s using shift registers for both axises, that’s another reason why you can’t do PWM. You just can’t shift out fast enough. You are thinking to much like a video signal. He’s running 14.7Mhz, refreshing the screen at 60 Hz, and he has three data lines, a h clock line, and a v clock line; 5 IO pins. Realistically, he’s maybe shifting out at max 1.8 Mhz assuming it takes at least 8 instruction cycles to set 3 IO pins according to a bitmap, and flip a clock pin. So now the fastest you can shift out a row is at 114 kHz. This doesn’t even count the cycles between rows and the other time needed to generate the bit map from the code. Not to mention, he’s already at a 1/16th duty cycle from the scanning already. Even if you manage to shift out to each row three times, you’re talking about obtainable duty cycle levels at 1/16th, 1/24th and 1/48th duty cycle. LEDs fall off brightness very rapidly after 1/16th as it is. 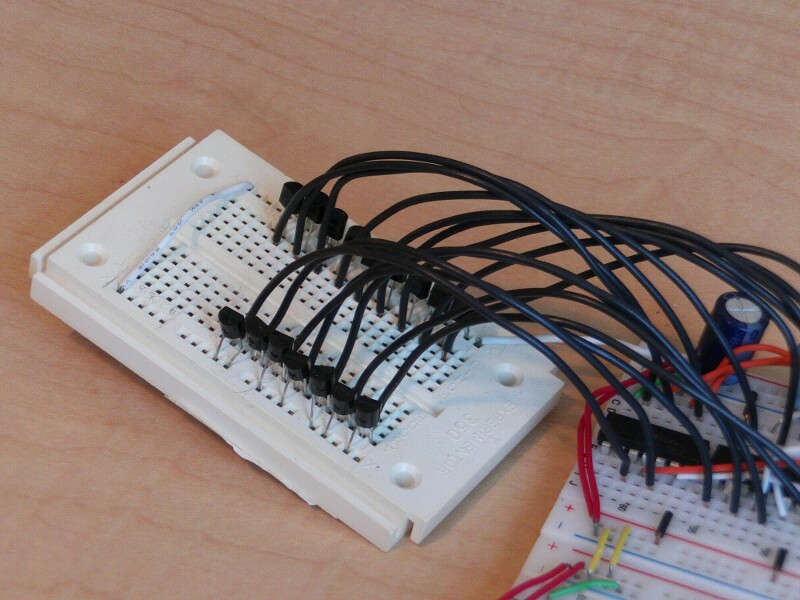 I tried several ways to attempt PWM through x and y shift registers, none really worked. Either the duty cycle fell off too quickly, or the frequency would fall out of human POV range. Well originally I found really nice 12-bit per channel pwm drivers which I was using, that’d make it into 48-bit color image. It was displaying the image well, however 48-bit 16*16 image would take a bit more then a kilobyte, and the microporcessor I had has only 1024 bytes SRAM. 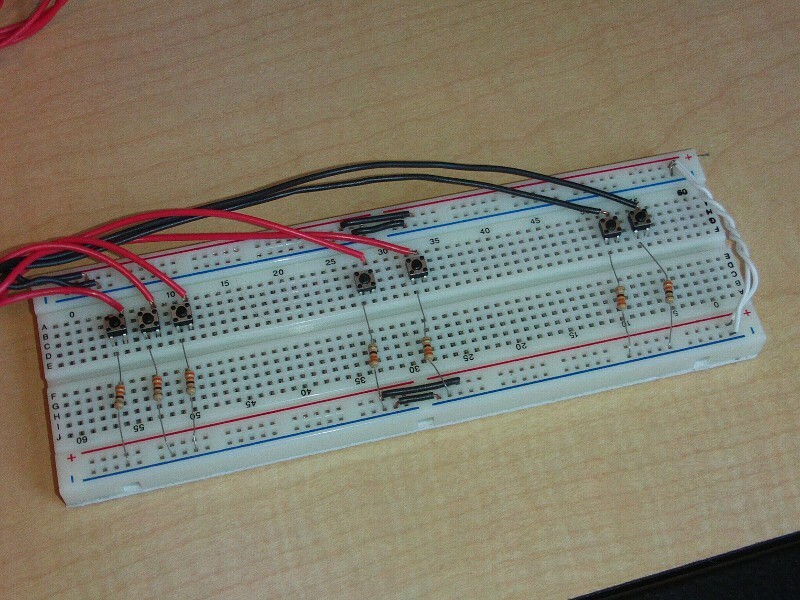 So after that I decided to use shift-registers just because of simplicity. 1. Spawn systems is probably the worst I seen. This is the coolest thing I’ve ever seen! Stan did a great job!